Since I’d heard it wasn’t enough to see the view from Victoria’s Peak by night, I decided to take a guided tour on my second day in Hong Kong that would let me catch this view by day within the comforts of an air-conditioned bus. I had time to kill before my afternoon tour, so I first hit up the Hong Kong Museum of History in Kowloon to get a better understanding of the island’s history and culture before seeing more sights. 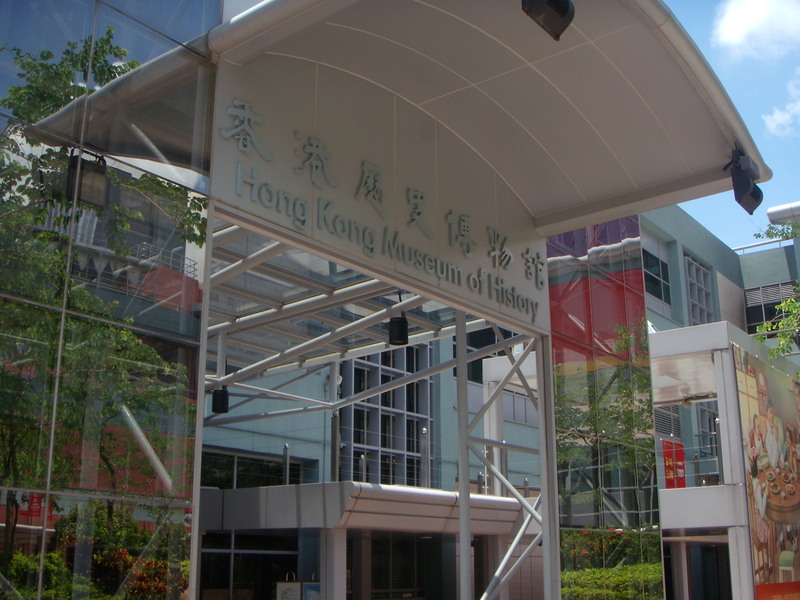 Established in 1975, the Hong Kong Museum of History occupies 17,500 sq. meters. The museum itself took six years to build. It flaunts a modern multistory design, eight extensive galleries as part of the permanent exhibit, and state-of-the-art toilet facilities (always a plus). The permanent exhibit, “The Hong Kong Story,” spans 400 million years of Hong Kong’s geographic, social, political and cultural history. Somewhere between the Neolithic period and the Han dynasty, I dozed off on one of the museum’s benches for a power nap, so as to keep myself energized for that strenuous, air-conditioned bus tour later. In fact, I wasn’t able to get through all of the galleries given the time constraints and the multitude of displays and reading material provided. Prior to that, the island was inhabited by four main Chinese ethnic groups who had migrated from the mainland: the Punti, the Hakka, the Tanka and the Hoklo. 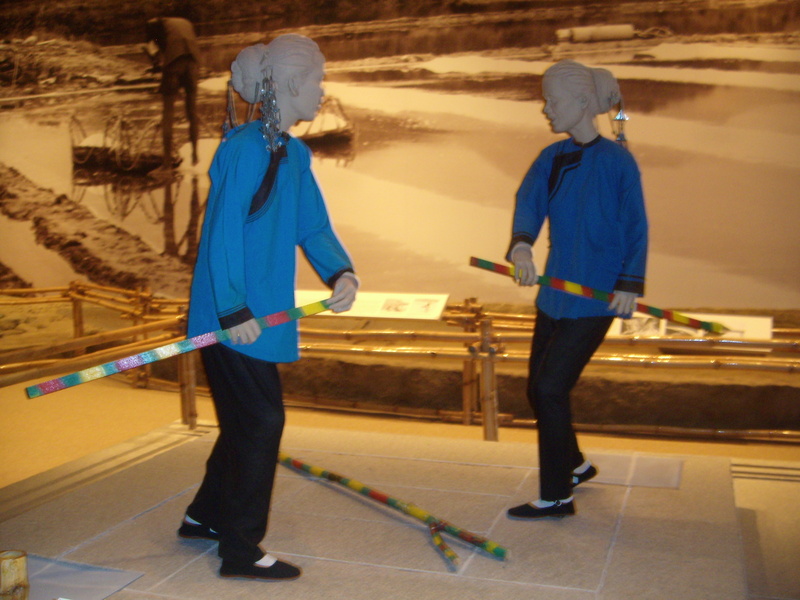 The Punti were considered the “local” people, as they had migrated to Hong Kong early on, in the mid-900s to 1120s. They lived in walled communities to protect themselves from bandits, and these communities usually centered around a worship hall. Decorations adorning a Punti ancestral worship hall. The Hakka were the agrarian people, considered “guests” because they migrated to the island much later than the Punti. They ended up having to settle the more infertile lands in the hills. As you might guess, the Punti and Hakka eventually clashed due to territorial issues. You’d probably find these in a traditional Hakka wardrobe. 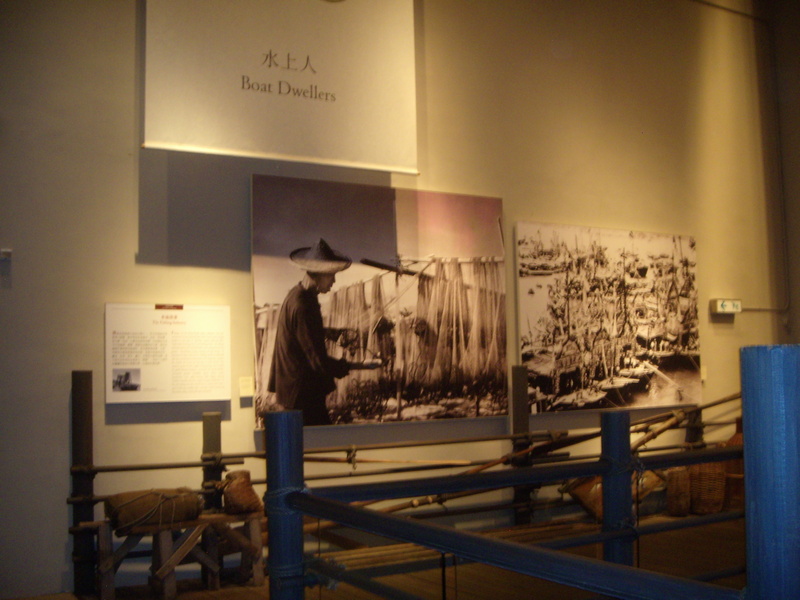 The Tanka, later referred to as the “boat dwellers,” settled into the areas along the Pearl River Delta. I figured that must be why Hong Kong’s nickname is the Pearl of the Orient—because it sits right at the mouth of the delta. Plus, it proved to be such a lynchpin to Britain’s triangular trade system much later. However, Google searches yielded no concrete answers as to how it got this nickname, although I did find conflicting information citing the Philippines as the true pearl. 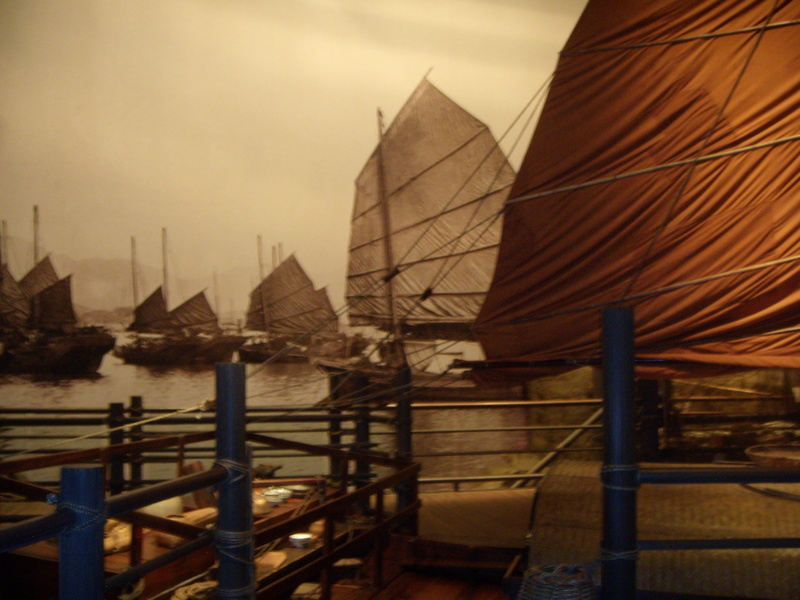 Like the Tanka, the Hoklo, settled the waterfront areas of Hong Kong from the coastal regions of mainland China, and made their living through fishing. 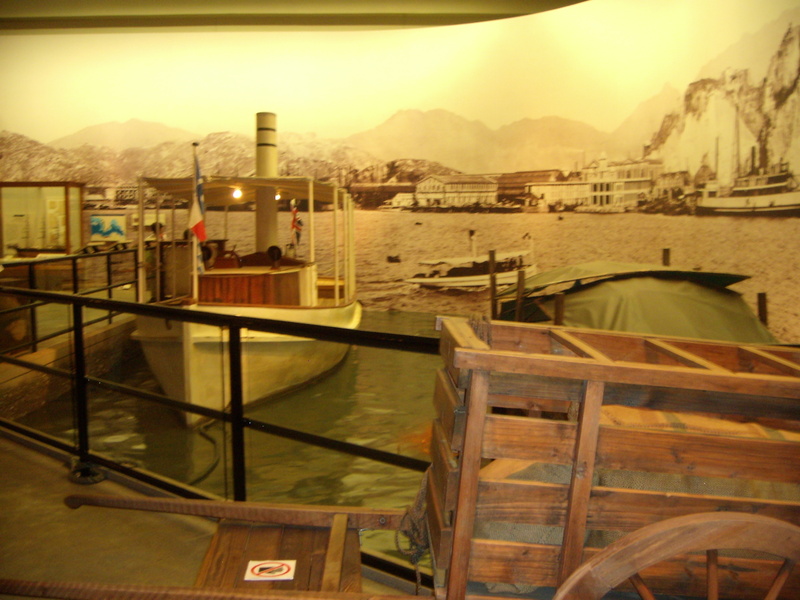 Fishing has been Hong Kong’s oldest industry, with grouper, herring and snapper among the most commonly caught fish. The boat dwellers eventually had to shift to thatched huts on land as their boats became dilapidated. Thus some of their customs, like their marriage customs, were adapted as well. This included a tradition in which the bride and groom would be transported in a dragon boat on the day of the wedding. This ritual eventually became a “dragon boat dance” with dance teams mimicking the rowing of boats using colorful paddles to the rhythm of drums and gongs. Today, this ritual sometimes includes a street procession of the groom’s relatives and neighbors to welcome the bride to their home. 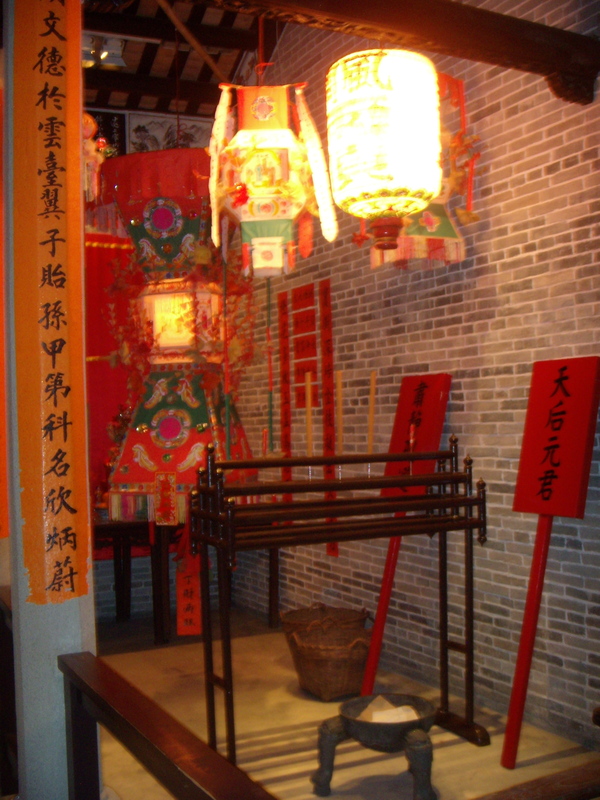 Marriage processions were common in the Chinese culture. Marriages were usually arranged with the help of a matchmaker, who would assess the compatibility of the couple using their birth dates and astrological measurements. These marriage rites reminded me a lot of our own Hindu traditions. Hindu marriages were arranged for the most part with the help of astrologers to assess a couple’s compatibility. In Hindu marriages, however, it’s the groom who is welcomed to the marriage site with a procession, either by horse (North India), or foot (South India). 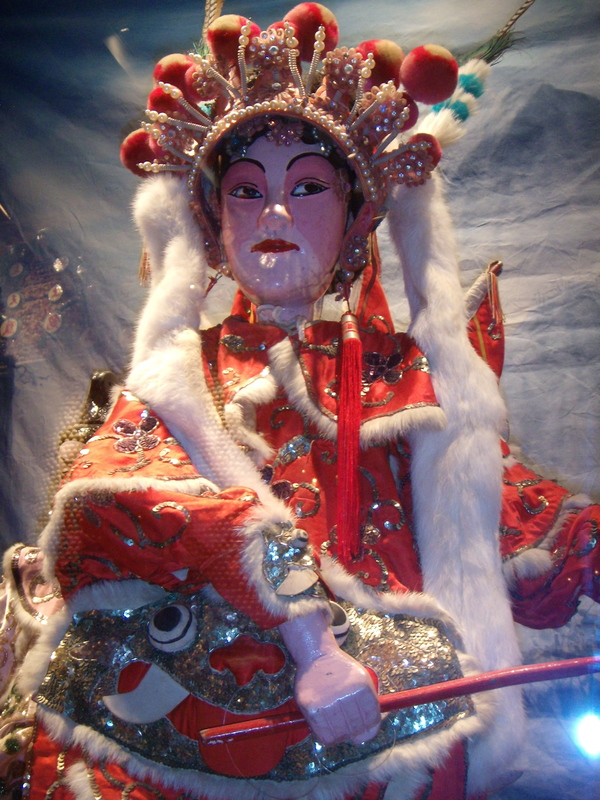 For entertainment, theater was a major pastime for Chinese people, as I learned in 1999 when I had the chance to attend a Chinese opera at a Beijing opera house. But the style I saw years ago in Beijing is slightly different from the Cantonese style I saw illustrated at the museum. For one, the Cantonese style replaced Mandarin with Cantonese for the spoken or sung parts, to make it more accessible to the people of southern China. 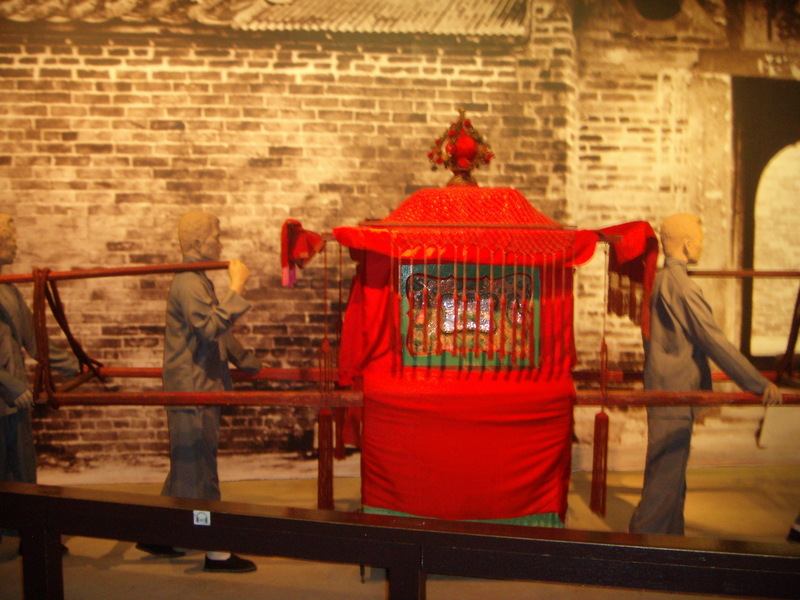 Scene from a puppet show depicting General Di Qing scoring repeated victories over the Barbarians. In the depicted scene, the general is finally defeated by the Kingdom Shan Shan and is accepted by them as their royal son-in-law. But because the general’s loyalty remains with his own kin, he gets the princess drunk and flees. When the princess recovers, she’s enraged and sets off to capture Di Qing. In this scene, Qing and the meet in the forest, prepared to battle. 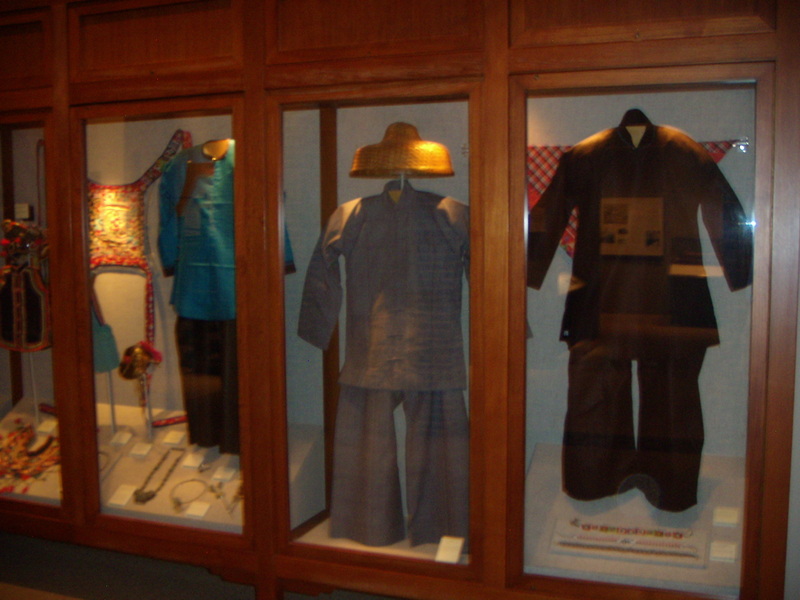 As an example, the museum had on display a scene from a puppet show. 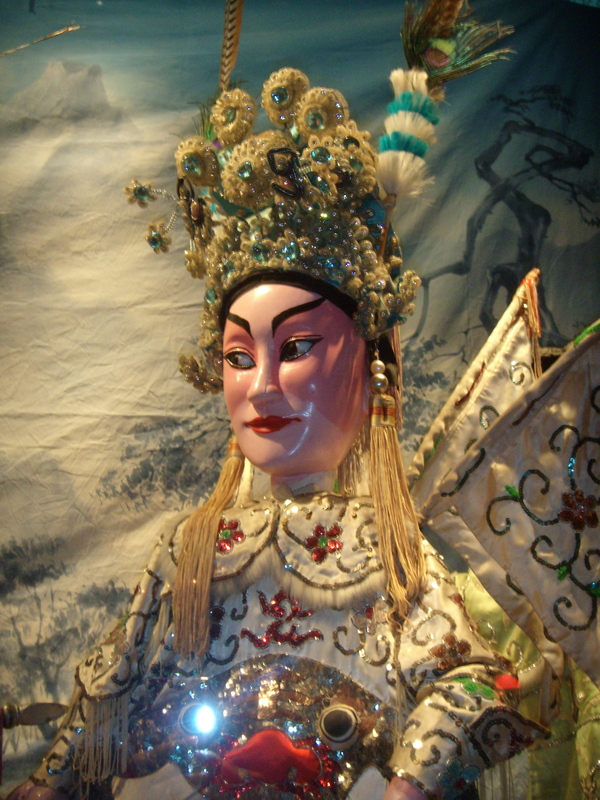 I just found the puppets’ expressions fascinating and their intricate costumes worthy of a picture. 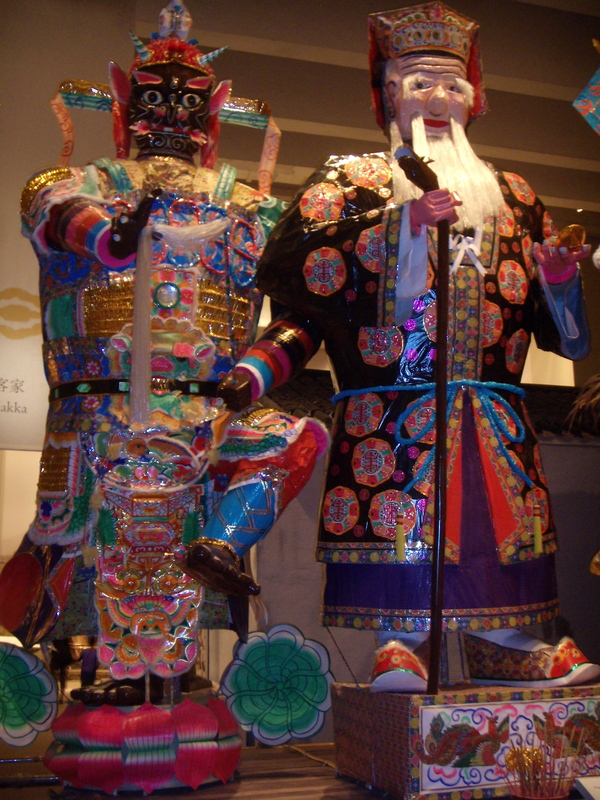 A puppet depicting a scene from “General Di Qing Repeatedly Defeats the Barbarians.” In this scene, Qing and the princess meet in the forest, prepared to battle. With little time left before my tour, I proceeded to galleries 5 and 6 on the Opium Wars and cession and growth of Hong Kong. It was following the Qing dynasty’s decline toward the end of the 18th-century that the presence of foreign powers in China’s coastal areas became more apparent. The British traded opium from India in exchange for Chinese tea. But the the Chinese quickly realized the addictive and debilitating effects of opium, and in 1839, imperial commissioner Lin Zexu placed a total ban on opium under instructions from the emperor. To put the Chinese in their place, the British decided on a “punitive” approach, leading to armed conflict, according to the Society for Anglo-Chinese Understanding. By 1841, Qing officials succumbed, handing over Hong Kong Island to the British. It remained a British colony until 1997. By the late 19th century, Hong Kong was handling more than half of China’s foreign trade.